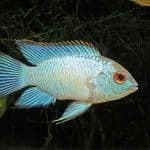 Fish keeping in a hobby loved by many, however not everyone can or wants to, commit to a large, time-consuming aquarium. 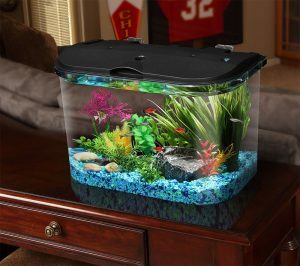 New fish keepers may opt, to begin with, something a little smaller, and a 5 gallon fish tank is a perfect size. 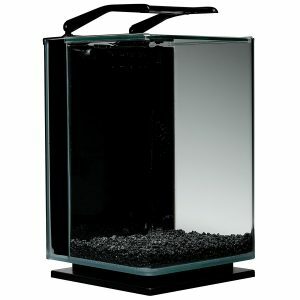 The Marina LED 5 Gallon Fish Tank is well constructed, from glass, with a hinged plastic canopy for easy access. The LED lighting module is built into the canopy and is powerful enough to create the illusion of daylight, meaning both fish and tropical aquarium plants can thrive. 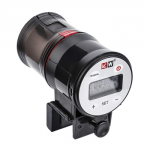 The filter is powerful and takes up minimal space due to it being a “hang-on-back” unit. It is quiet and powerful, featuring a 2-step filter system, one cartridge being a Bio-Carb cartridge and the second being a Bio-Clear cartridge. Both cartridges contain Ceramitek which is an extremely absorbent ceramic filter media. Nutrafin Max tropical fish food, containing multi-vitamins and color enhancers to provide tropical fish with all the nutrients they need. Nutrafin Aqua Plus water condition, this is added to tap water and removes Chlorine and heavy metals from the water, making it safe for fish. The bottle is large enough to last several water changes. Nutrafin Cycle, a biological filter supplement that helps the nitrogen cycle in new aquariums. This supplement will help to remove ammonia and nitrites which are toxic to fish. A fish net to aid in the safe capture of fish for removal for cleaning. A thermometer, to ensure that the water temperature is consistently at an appropriate level for tropical fish. The Marina LED 5 gallon aquarium is not sold with a filter, however, a 25-watt submersible heater can be purchased cheaply. 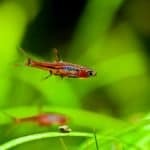 A care guide, to provide new aquarists with the relevant information and advice to set up an aquarium and care for their fish. 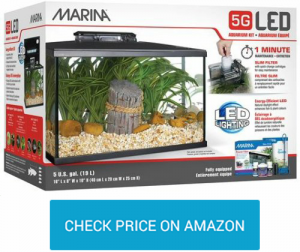 The 5 gallon aquarium Marina LED kit is excellent value for money and includes almost everything a beginner would need to start their new hobby properly. If you are interesting in 10 gallon tank this kit is also available in 10 and 20 gallon tank. The Marineland ML90609 5 Gallon Fish Tank has a curved glass front set portrait orientation, as opposed to the usual landscape. This makes is an ideal aquarium for tall plants such as Amazon Sword and Bacopa Caroliniana. The sliding glass canopy makes for easy access to the aquarium and the curved, seamless glass and hidden filtration system mean completely panoramic and unhindered viewing from every angle. The Marineland ML90609 Portrait 5 gallon Aquarium Kit boasts LED lighting kit with two modes; bright white, for daytime use, and blue for night-time use. The lighting unit is hinged and can be pushed back for easier access to the aquarium for internal aquarium filter change, cleaning, and feeding. 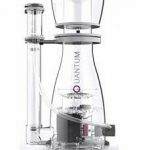 The filtration system is discreetly hidden and is powered via a powerful yet quiet air pump. This aquarium features an adjustable flow meaning the water flow can be set accordingly for the tank’s inhabitants. The filter uses a RITE-SIZE Z cartridge, which is a double-thick poly fiber pad and is contains activated carbon, and Bio-Foam, enabling comprehensive 3-stage filtration, mechanical, biological and chemical. 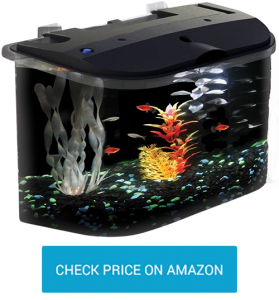 It is difficult to find fault with the Marineland ML90609 5 Gallon fish tank. It’s design is modern and stylish and the filtration system is beautifully hidden. 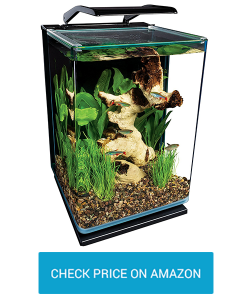 The Fluval Spec V is designed to take as little space as possible, whilst still being an adequate size for fish such as bettas, tetras, or shrimp. It is ideal for desks, bookshelves and kitchen counters. The body is crafted from high quality, laser etched glass, with aluminum trim and the lighting unit boasts a stunning 37 LEDs in an attractive strip light, which runs almost the entire length of the aquarium. Much like the Marineland ML90609 the Fluval Spec V uses 3-step filtration, making for a cleaner, clearer aquarium. In this 5 gallon aquarium, the 3-steps are foam block, activated carbon and Fluval’s own BioMax bio rings. The filtration system is also adjustable, meaning power can be made as strong or weak as desired. 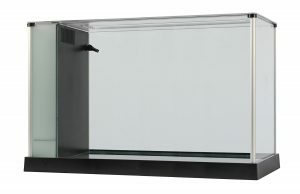 The Fluval Spec V 5 gallon aquarium is a sleek and stylish aquarium which only requires a small amount of space. Once again this aquarium does not include a heater, however, a 25-watt can be purchased for next to nothing. The price is a little higher than it’s competitors but that can be excused for the super modern design. 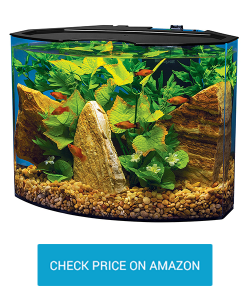 The API Panaview 5 gallon fish tank is flat-backed with a curved front and is made from durable acrylic, making it child-friendly. The seamless acrylic makes for complete, unobstructed view from any angle. The API Panaview’s lighting unit is built into the hinged canopy and offers seven colors; amber, aqua, blue, green, purple, red, and white. This illuminates the aquarium beautifully. The Superclean 10 filter has a flow rate of 45 gallons per hours, which is very strong. It works with the Bio-Chem Zorb cartridge which removes any debris from the water. 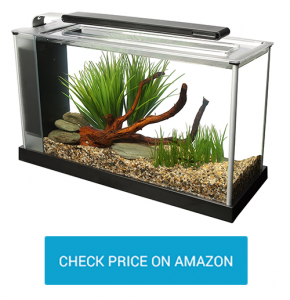 The API Panaview is the cheapest aquarium on this list and is more than worth the money. 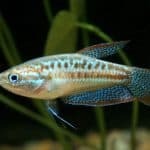 The filter is a little strong for smaller fish such as tetra, but with some research, more suitable fish can be housed in this wonderful aquarium. The Tetra Crescent Acrylic 5 gallon Aquarium Kit is made from strong acrylic and it’s crescent shape makes for excellent fish tank viewing. The Tetra Crescent features a mechanical filter containing a dense, double-sided cartridge to catch waste. The cartridge also contains Ultra-Activated Carbon. The lighting unit is built into the hinged canopy and features bright white LEDS to illuminate the aquarium adequately. A good, basic 5 gallon fish tank that is easy to set up. If you are looking bigger aquarium, check our articles 10 gallon fish tank reviews and 20 gallon fish tank reviews.